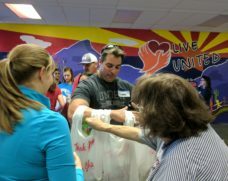 On Saturday, November 12, twenty Jokake employees spent the morning ending hunger with the Valley of the Sun United Way. 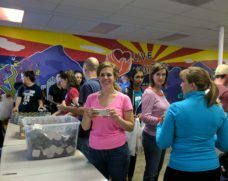 Their efforts, along with nearly 100 other volunteers, resulted in 1,560 WeekEnd Hunger Backpacks. Each Backpack contains seven supplemental meals, including juice boxes, granola bars, and cereal. 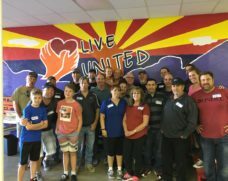 The United Way hand delivers WeekEnd Hunger Backpacks to nine schools throughout the valley that help feed over 500 children each and every weekend during the school year. These meals ensure each child has food over the weekend and returns to school on Monday ready to learn! 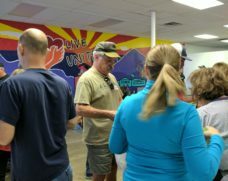 Fun was had by all, including family members! Ryleigh Dunn, Superintendent Dan Dunn’s 10-year old daughter, drew and wrote colorful notes to the children receiving backpacks. A team of superintendents helped tie and box the Backpacks, getting them ready for delivery. 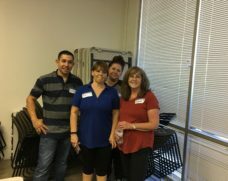 Iris McKinney (HR), Missy McKinney (Field Coordinator), and Sue Demaline (Contract Administrator) helped the volunteers pack bags while the remaining volunteers worked to fill the 1,560 Backpacks.